Discussion: Michael Stackpole weighs in with his thoughts on "zombie" novels, books written as followups in worlds created by a deceased author, and questions whether or not readers are best served or not by never-ending rehashing. It's a similar situation that's plaguing Hollywood with the parade of remakes and reimaginings... why are the suits in charge of the publishing houses and studios becoming more and more leery of new material? 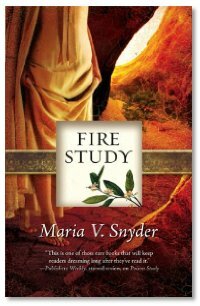 Interview: Michael, Summer and Michael talk with Maria V. Snyder about, Fire Study, the third book in her very popular Study series. The series follows Yelena, who starts out as a slave who's been condemned to death, but is offered a chance for reprieve by becoming a commander's food taster. It's full of mystery, magic, intrigue and romance that grows from Poison Study, and follows through Magic Study and now into Fire Study. The series also employs a unique system of magic and how the magicians of the world have to work with that system without adversely upsetting the physical world. Be sure to check out the reviews of the first two books by Lora Friedanthal, and come back for a review of Fire Study soon! Random complement - I've really been enjoying the episodes lately. I haven't listened to this one yet, but I'm sure it's good too 😉 Always, always love the interviews, you get some really interesting people. How does the 'concern' over big publishers bringing out more and more derivative material based on 'franchise names' square with the fact that big publishers are behind the times and probably facing extintion anyway? All these works will ultimately live or die by their quality, and they're not all necessarily done as a big money-making scheme. The example of the Null-A sequel by John C. Wright is an interesting one. In a recent interview for the SCiFi DImensions podcasts, he talks about its being more of a labour of love and that he won't be doing any more books of this type because 'he's got to eat'! Just found this page, very interesting! I've read Maria V. Snyder's "Study" novels and really enjoyed them all. For some reason they are categorized as "Romance," although I always felt them to be more of fantasy novels that just happens to have a great love story... Especially the first one, where the "romance" doesn't really come into play (or at least not obviously) until the very end. I've currently got too many podcasts I'm listening to, but after listening to this episode I realize that this is one I can probably drop. Your discussion surrounding John C. Wright's Van Vogt sequel is witless on so many levels that I hardly know where to begin. Let's start with your characterization of Van Vogt's world as a "cash cow." Apparently you have no idea what the term "cash cow" means. Nobody reads Van Vogt any more. Most of Van Vogt's works are out of print. If I walk into my local Barnes and Noble, there's NO Van Vogt in it! But you actually think that somebody had the bright idea that the way to get rich is by writing a novel in Van Vogt's universe. Amazing. As for your implication that Wright is some hack who's writing in Van Vogt's world because he can't or is unwilling to make his own, you are apparently unaware of Wright's other work. He does create his own worlds. The only books of his that I've read are his "Golden Age" trilogy, and it's wildly imaginative and written by a man with serious talent. Next, for your statement that Wright's book is crowding out some young author who's created his own world. First of all, that writer would be just as crowded out if Wright had written a book in a universe of his own creation. Secondly, you skewer Wright for writing one book in Van Vogt's world, while completely neglecting the myriad authors writing in the worlds of Roddenberry and George Lucas. With such a tendency towards selective focusing, how do you cross a street without getting hit by a car? Third, if our concern is only for the livelihood of new writers with new worlds, and not for the quality of the literature itself, then we should not only rid the shelves of Wright's book, along with all the Star Wars and Star Trek novels, but we should also clear the shelves of all of Asimov, Heinlein, Clarke, and everyone else whose books people buy instead of buying books by authors set in new worlds. Finally, to condemn a book on economic grounds with no consideration whatsoever of whether it might actually be any good or not betrays an obsession with money that's unseemly, to put it kindly. While clearly writing is a business and money is important, you seem completely out of touch with the fact that there may be other considerations in writing besides money. Seldom have I encountered so much ignorance crammed into such a small amount of time.